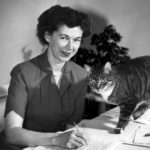 Beverly Cleary is an American writer of children’s and young adult fiction. One of America’s most successful living authors, 91 million copies of her books have been sold worldwide since her first book was published in 1950. Some of Cleary’s best known characters are Henry Huggins and his dog Ribsy, Ramona Quimby and Beezus Quimby, and Ralph S. Mouse. The majority of Cleary’s books were set in the Grant Park neighborhood of northeast Portland, Oregon, where she was raised, and she has been credited as one of the first authors of children’s literature to figure emotional realism in the narratives of her characters, often children in middle class families. "I don’t think children’s inner feelings have changed. They still want a mother and father in the very same house; they want places to play." "I didn’t start out writing to give children hope, but I’m glad some of them found it." "I write in longhand on yellow legal pads." "When I was in the first grade I was afraid of the teacher and had a miserable time in the reading circle, a difficulty that was overcome by the loving patience of my second grade teacher. Even though I could read, I refused to do so." "I don’t necessarily start with the beginning of the book. I just start with the part of the story that’s most vivid in my imagination and work forward and backward from there." "In my grammar school years back in the 1920s I used my ten-cents-a-week allowance for Saturday matinees of Douglas Fairbanks movies. All that swashbuckling and leaping about in the midst of the sails of ships!"